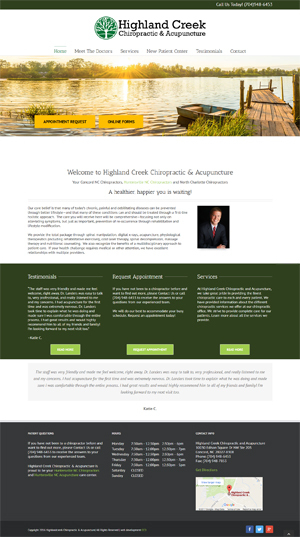 Carolina Custom Designs is proud to have completed a redesign for Highland Creek Chiropractic and Acupuncture. We are also in a long term agreement with Highland Creek for SEO services, web maintenance and web hosting. It is a pleasure to work with Dr. Michael and Stephanie Landers and their team to optimize their company’s website. At Highland Creek Chiropractic and Acupuncture a healthier, happier you is waiting! They focus not only on alleviating symptoms, but prevention of re-occurrence through rehabilitation and lifestyle modification as well.